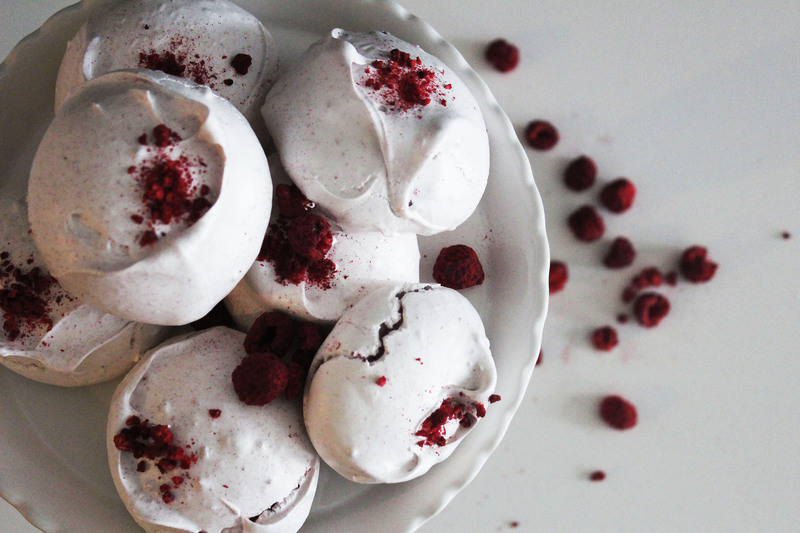 Meringues are sort of like an adult low carb marshmallow, light, airy and the perfect snack for hot days during the summer. Hey everyone! I actually do like trying things other than muffins and cookies and I’m pretty stoked that today’s post proves that, I’ve already done a meringue cookies post, but that was with the basic meringue recipe; I figured with this post we could get a little fancier and try different techniques and still get the same delicious results except with a upscale flair. In this post, once again, I’m using freeze dried fruit, I bought all my freeze dried fruit around the same time near the end of May; when I saw how much went in each bag, I was actually pretty surprised, only a few ounces, I figured I’d finish it in no time and at $7 USD I’d like a little extra bang for my buck, but it actually adds up to quite a lot, you don’t need much for each recipe and it never goes bad, obviously since we’re in July and I’m still using it, so happy face for freeze dried fruits. Adjustments: this recipe makes, once again, enough for four, but it also makes enough for how big you dollop, you’ll see in the pictures it made almost 8 which is a good number, but if you need more you can double the recipe, it also helps to know that each egg white is 3 tablespoons (30 grams) and the sugar per egg is almost 4 tablespoons (60 g). Also you can just make it easier on yourself and do 1/3 cup (70 g) of sugar per egg, just know that your meringue will be sweeter. 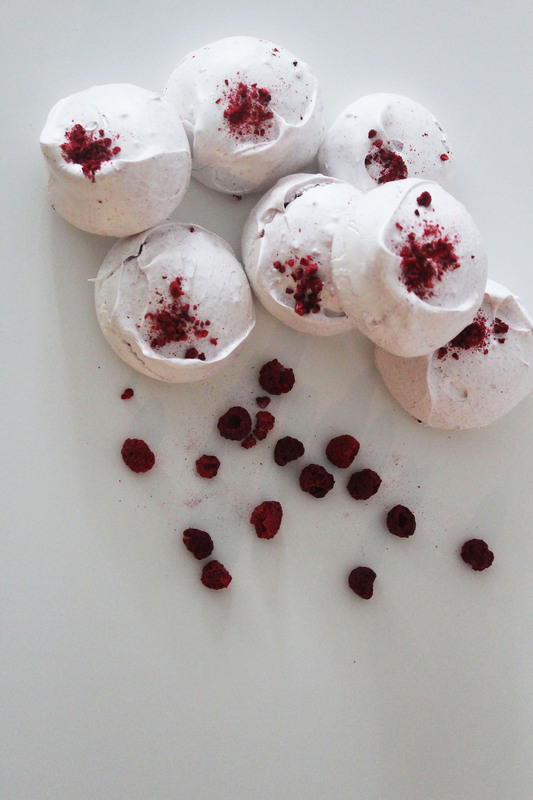 So now onto important things, obviously with the title of this post, the Swiss part of the meringue is important. 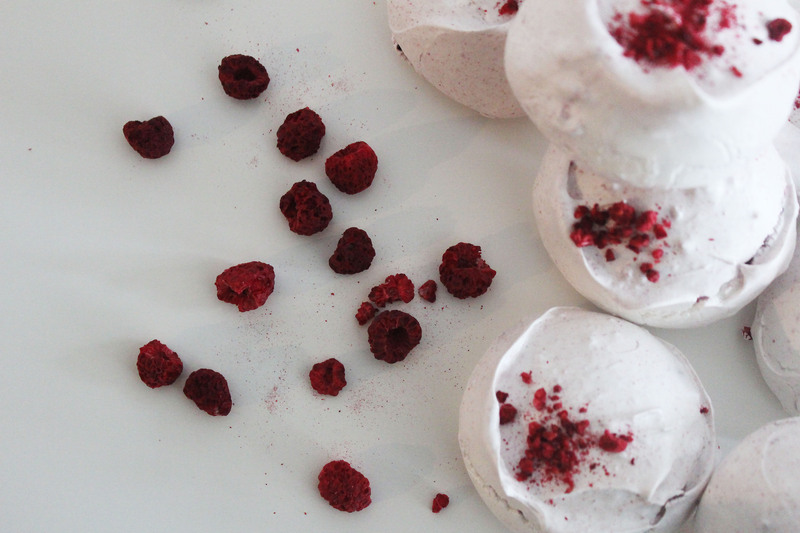 There are three types of meringue: French, Italian and Swiss. Both Italian and French, have a habit of being lighter and airy while the Swiss tends to be a bit denser and the texture resembles that of an even lighter marshmallow. In addition to texture, the cooking method for each are different as well, with French meringues you whip the egg whites alone and then add the sugar; with Italian you make a simple syrup, separately mix your eggs white and then stream your hot simple syrup into your beaten egg whites (like marshmallows), then with Swiss meringues you cook the egg whites, sugar, plus some cream of tartar together over a double boiler and then mix with your hand or stand mixer. Of all of these methods the Swiss technique is the most stable and ensures the higher percentage of not messing up. 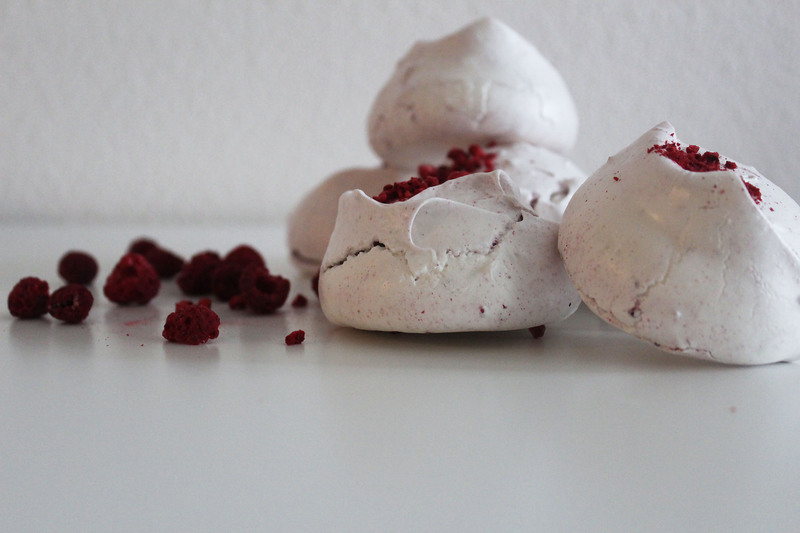 Helpful Hints & Suggestions: when it comes to making the meringue, don’t stress, I purposely choose a Swiss meringue because it is the “fool proof” of all the meringues, you can alter the amount of raspberries to your preference and remember that you start the mixer on low but before your first of five minutes is up you want your hand mixer to be on high speed. You also want to be constantly moving the hand mixer; it shouldn’t stay in one place, the more you mix the mixture the thicker and fluffier it will be. 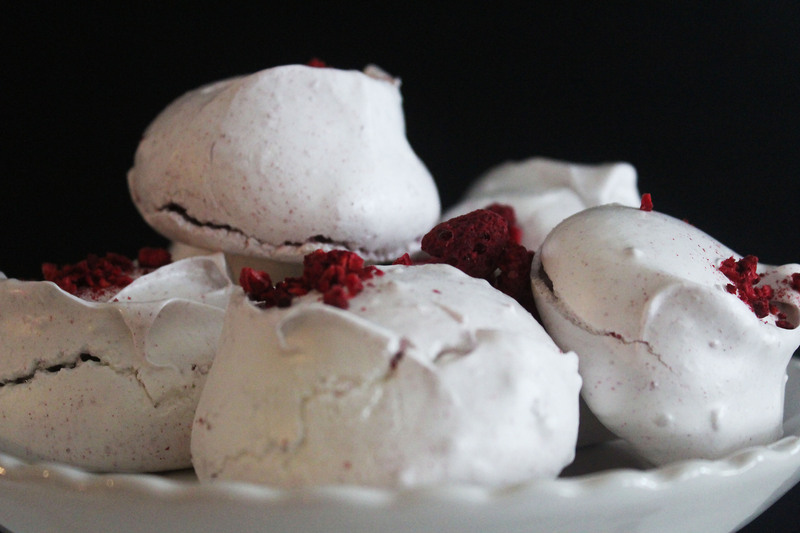 In terms of aesthetics, I prefer medium size meringues, if you’re one to prefer small kiss sizes then you can pipe it out with a piping bag and tip no problem, but you may need two cookie sheets instead of one. 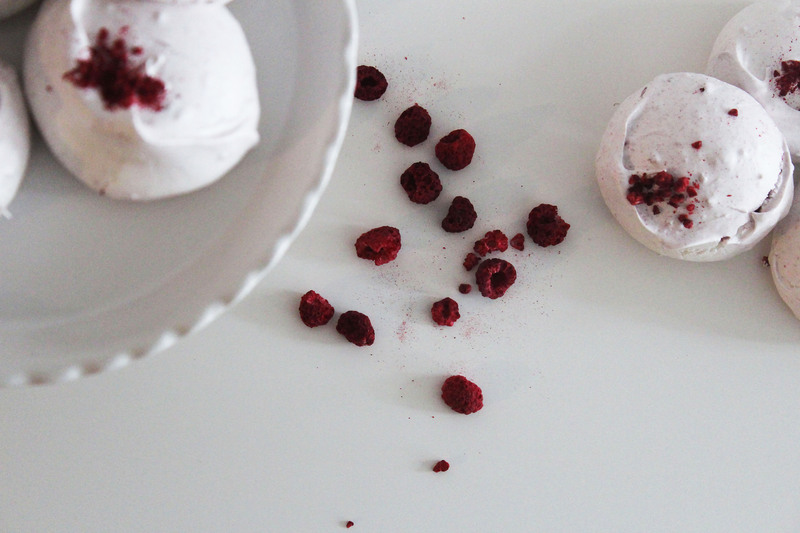 Also you’ll see I sprinkled some extra freeze dried raspberries on top, it doesn’t burn because we bake it at such a low temperature, so it’s perfectly fine and it also keeps that nice bright color as well. Ta-Ta-For-Now: thank you all for reading and enjoying the pictures (which I think I’ finally getting better at) or the literary post. I love using the stove every once in a while for my baking and it always leads me to wonder why I don’t do it more often, then I look at candy burns on my arms and remember, but this doesn’t involve any candy burns and it’s so simply yet so elegant; plus psttt it’s low in carbs as well!